2.LEAVE A COMMENT & LET ME KNOW YOU ARE FOLLOWER. 3. CLICK ON MY PROFILE, YOU WILL BE DIRECTED TO A NEW PAGE. THERE YOU WILL SEE THE WORD EMAIL. 4. CLICK ON THE WORD EMAIL. SEND ME A REQUEST FOR THE CLIP ART YOU WANT. I WILL SEND YOU A PDF IF YOU ARE A FOLLOWER. 5. SHARE MY LINK ON YOUR/FAVORITE BLOG/S, GROUP, FORUM, FACEBOOK, TWITTER ETC. *FOR PERSONAL USE ONLY - DO NOT SHARE, COPY, RESELL, MAKIE INTO NEW CLIP ART OR SELL PRODUCTS USING IMAGE. yOU MAY SUBMIT YOUR ARTWORK FOR PUBLICATION, IN GALLERIES, GROUPS, FORUMS, CHALLENGES, ETC. BUT YOU MUST GIVE CREDIT TO cathies pARTies. All rights remain. copyright cathies pARTies 2011. If you would like a CUSTOM ORDER for these gift tags you can have them made with a choice of fonts for the sentiments, as well as the words to: & from:, you may also have a choice of sentiments. Just Convo me your needs & I'll see what I can do. There is a nominal fee for CUSTOM ORDERS due to the time it takes me to edit changes in design. 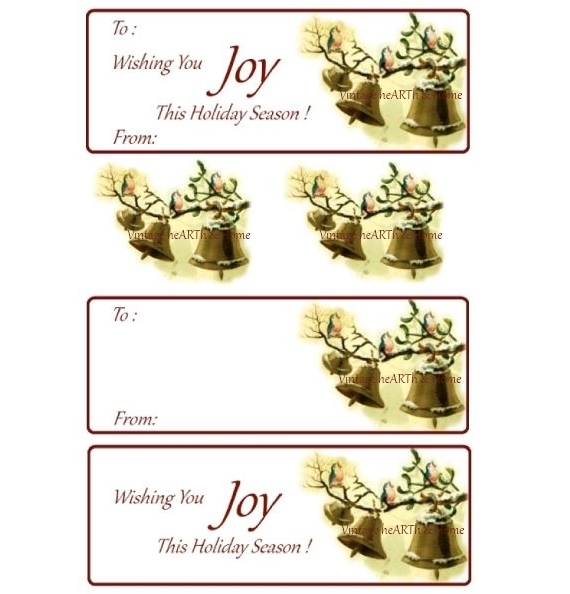 They can also be made into personalized address labels for all YOUR HOLIDAY CARDS & PARCELS. Once you have your paid CUSTOM ORDER - YOU can print infinite times on your home computer. Again, personal use only! All rights remain copyright cathies pARTies 2011. Hello, I just became a follower of your site. I have been looking around some, I really like the site. Do you have a newsletter I can subscribe to also? Thanks for your interest in my newest free download. To receive your copy without the watermarks please return to my blog & leave a new comment including your email (I delete all comments including emails) OR go back to blog & click on my photo on the sidebar, it will open a new page. There you will see a button that says EMAIL. Click on that - then leave a request. Hi Cathie - I am a new follower. I would also really like your freebie - and a newsletter if you have one! Love the new Christmas tags. Hello Cathie, I am a new follower. Love your files. Cathie, these tags are just beautiful. Thank you!